David Mitchell starts his hour with us by reading this passage from chapter XXXIX of The Thousand Autumns of Jacob de Zoet. Having not yet made it to this part of the book myself, I instantly grow determined to persevere with what I’m finding to be a demanding yet rewarding read. I’ve flown up from Wellington with a clammy handful of questions to ask about writing, narrative and genre but also with acceptance that being in the same room as a literary master will be inspiring enough. There’s little time to linger on the last line of his first reading, but enough to make the connection that Mitchell is far too humble to ever suggest he his creating masterpieces. He lets us applaud and release our held breath before confessing he’s completely sick of his latest book and wants to read us something entirely new. A short story, An Inside Job, which he says is also an excerpt from the novel he’s writing at the moment. It appears to be a return to family oriented stories with a split marriage, jealous father and somewhat precocious-sounding young son. It also seems to be set in Worcestershire – perhaps a return to Black Swan Green? Emily Perkins asks the thoughtful questions of a well-read Mitchell fan and the audience quickly tune into the humour and humility of our guest. He talks a lot about The Thousand Autumns, which – as a historical novel – sounds like a huge amount of work went into researching and crafting a sense of authenticity. As the novel explores different cultures and language, Mitchell says the great difficulty came in creating a plausible voice for all his characters that wasn’t “too authentic.” Twenty-first Century readers need to believe in the language of the characters but if it’s too real it starts to “sound like Blackadder.” Instead, Mitchell had to create what he called a kind of “bygonese” – language that we accept to be of a certain era. Again and again David Mitchell shows us that he loves to talk about writing but in no way does he at all assume we’ve read his work. A fair assumption it would have been too, given the size and calibre of the crowd. When asked about his writing process, Mitchell describes his ideas for novels as always there circling “like aircraft in holding patterns, waiting for their turn to land.” So no writer’s block then? He says he became anxious to finish The Thousand Autumns so he could get on with the next two novels, which he has a clear sense of already. Perhaps the opposite of writer’s block then? A flood-gate of sorts. He admits that he is “wildly over-ambitious” with all his writing ideas, creating “literary cathedrals” that collapse under their own weight. The novels themselves come out of the “rubble” or the bits and pieces that survive the crash, “palimpsests” echoes and memories of the grand ideas they began as. Surely a self-deprecating remark but it does seem likely when looking at the structure of all his work: pieces stacked and rebuilt, connected by tough thread. He quotes Alan Bennett’s “Style is the sum of one’s imperfections,” suggesting that any mistakes he makes, he makes his own. Hearing writers talk about the writing process is enlightening. As a reader and teacher of David Mitchell’s books (my Year 13 class are studying Black Swan Green as we speak), unpacking the creative mind is not necessary to the enjoyment of the novels but it certainly adds to it. Mitchell says, of the five elements of a novel – plot, character, structure, style, theme – he always starts with the plot and character; ideas evolve as he writes. He says it’s important to get plot and character right, but novels need to have ideas too. For example, the idea of ‘miscommunication’ became interesting as he researched and wrote The Thousand Autumns, but it was not where he started. He says all novels end up having a few “default themes” such as ‘memory’ or ‘freewill’, even if that’s not what they’re trying to be about. ‘Story’ is always about remembering and trying to pin down a kind of truth and when creating characters it’s inevitable to start thinking about who’s really in control. But the idea of ‘miscommunication’ is pertinent and seems to run through many of his novels: Jason in Black Swan Green stammers and can only really express himself secretly in his poetry; Ghostwritten has a transmigrating soul trying to be heard, as well as characters who hide, are blind or are merely voice. In Cloud Atlas, miscommunications are deadly. Perhaps this comes from Mitchell’s own speech impediment and the effort he has had to go to to communicate. As a stammerer, he has said he must think further ahead in the conversation than most people to see what words he will need to replace, resulting in him having a deeper understanding of language and speech than other writers. His most self-assured moment comes when he admits he is very good at writing dialogue and creating convincing character voices. Mitchell’s reasons for writing seem to be standard, and maybe we shouldn’t ask people who do something so brilliantly why they do it. It certainly sounds as though he has to write – with so many ideas circling above his airport-brain, but, like many writers, he is fascinated by the power of story and how dependent we are on narrative to help us make sense of the world. However, when asked about his own story, he says he’s never been that interested in it but more the “common denominators between all our stories” which therefore becomes “the human story.” This might explain why his first three novels do not hint at his own life at all and he says he didn’t want to write about himself until he started his own family and became more interested in domestic life. Black Swan Green was written as Mitchell became fascinated by the constant “changing gear shifts of marriage” and started to think about his own beginnings. 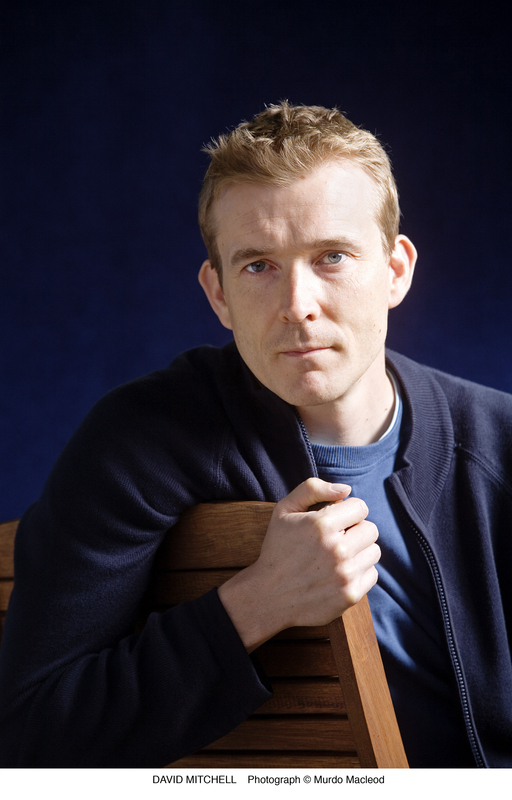 When asked about his influences, Mitchell says he also writes because he “aches” to make people feel the way he has felt reading some of his favourite writers. However, he dismisses these as influences and spoke more of an aspiration to be as good as the writers he loved as a kid. The hour is up before I get to ask my own question, but I feel he’s answered so much more. It’s not just being in the presence of a great mind that’s awe-inspiring, it’s being part of the conversation, adding to our collective human story. Thanks for posting this—and for making me aware of his new work. “Black Swan Green” is a beauty of a book. And his new one is too, judging by the except you gave us. I’m so glad to know more of this wonderful writer.